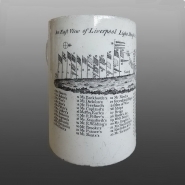 Creamware mug printed in black with "An East View of Liverpool Light House & Signals on Bidston Hill 1789". The Bidston Hill Signals were on the opposite side of the River Mersey from Liverpool, and were a landmark for ships approaching the town. The signal station was the last in a chain stretching from Holyhead, which relayed to Liverpool advance notice of ships approaching from the west. Each flag indicated the ships of a different merchant: for example at no.33 are the Tarletons (click here for jug in this exhibition with print Lieutenant Colonel Tarleton). At no.42 the "London Cheese Ships" were coming to collect the famous Cheshire cheese which was exported through Liverpool. As the trade of Liverpool expanded the number of flags grew, their numbering changed, and the print was updated. The earliest version on pottery is dated 1788 and has 43 numbered flags. This is the second version, with 47 numbered flags. A third, with 56 numbered flags was produced by 1793. A fourth version was produced in that year: a new flag indicating "Enemies" was added because France declared war on Britain. The curvature of the mug means it takes three views to show the whole print. 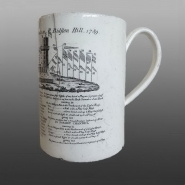 Both the present version and the 56-flag version of the print are found on mugs bearing the impressed mark of Ralph Wedgwood's pottery at Burslem, Staffordshire. Although Ralph Wedgwood did black-printing at his factory, it is perhaps more likely that these pieces were printed in Liverpool for the port's maritime trade. Pieces of a mug printed with the Bidston Hill Signals have been excavated outside the house of Captain Robert Lund at Portsmouth, New Hampshire. He was master of the Lydia between 1792 and 1810, and is known to have sailed home from Liverpool in 1795 with a cargo of Cheshire salt. He was probably a typical customer for this print. The print is dated 1789, the same year in which Ralph Wedgwood is thought to have begun production at his Hill Pottery in Burslem.